Get the Truth on the Myths of Home Buying! Buying a home is a major step! And, for first time home buyers, it can seem like a daunting task. There is plenty advice out there about what steps to take, the process, financing, and more….but unfortunately there are also a lot of misconceptions and misinformation. It is important to know all the facts before setting off on your journey to find your dream home. Here are 9 myths about home buying that we are happy to debunk for you!! Myth 1: Looking for a House is Your First Step. The initial search for the home is undoubtedly the fun part of the process. You know your list of desirables and you have the internet at your fingertips to help you find your dream home. BUT, there is a lot of information that you need know ahead of time before potentially getting your heart set on a home. Your first step should be to make sure that your credit is in top form AND get pre-approval for a mortgage. These steps will help you determine your budget and allow you to search for houses that are in an appropriate price range. Plus, pre-approval for a mortgage will help you during the process as it makes you more attractive to sellers. Myth 2: Your Best Finance Option is a 30-Year Mortgage. Many home buyers think that by selecting a 30-year mortgage they will automatically save money since they have a longer period of time to pay off the loan. Although monthly payments on a 30-year are lower than a 15-year mortgage, you will end up paying MORE in the end since you are borrowing the same amount of money for both BUT are borrowing for twice as long and at a higher interest rate with the 30-year option. Look into all loan options out there before making a decision. A 30-year fixed mortgage might be the best option for you or there might be another loan that makes more sense. Stay open and do plenty of research ahead of time to make an informed decision. Check out our helpful Finance Information for this step of the process. Myth 3: Your Down Payment has to be 20%. Although a 20% down payment allows you to avoid paying for Private Mortgage Insurance (PMI), it is not always the required amount from lenders. If you are willing to pay the monthly bill for PMI, you may be eligible for loans with a 5% or 10% down payment. Otherwise, there are also FHA loans and other down payment assistance options that you may qualify for. Myth 4: The Down Payment is your Only Cost Upfront. The down payment on the home will never be the only cost you have to pay up front. There are always added costs for credit reports, inspections, insurance, and more that home buyers need to account for. Additionally, the negotiated deal for the house could include you being responsible for the closing costs. Myth 5: You are out of Luck if you have Bad Credit. Having good to excellent credit definitely helps when it comes to buying a home. But, even if your credit is not great, you can still be eligible for some financing options. FHA loans can offer low down payments to buyers with bad credit. Be sure to do plenty of research ahead of time though regarding your loan options. Something that might look great at first, might not be great in the long run. 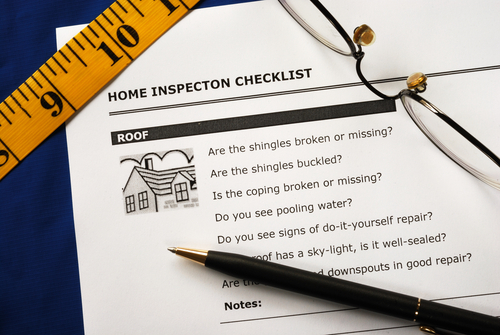 Myth 6: Home Inspections Aren’t Necessary. A home inspection is ALWAYS a crucial step in the home buying process. Even if you are worried that you might lose out on the house to a buyer that waives the inspection, it is worth the risk. There is far more risk in buying the home as is without knowing any hidden issues with it. You will save a ton of money and time buy spending the money upfront to inspect the home. Myth 7: You Must Offer the Asking Price. You found your dream house and you don’t want to risk losing it…..so you have to offer the full asking price, right? Although there can be competition when putting an offer on a house, you do not need to offer the asking price. Sellers will often be willing to negotiate with buyers who have awesome credit, a pre-approved loan, and a ready down payment in order to ensure that the house gets sold as soon as possible. You also do not need to offer the full asking price if the home inspection you got exposed some issues with the house. You can negotiate a price based on what the inspection found. Myth 8: You Don’t Need a Realtor. It is important to work with an Experienced Realtor during your home buying process. Although the internet might make it appear like it is easy to buy a home on your own, there is a lot of valuable information that realtors know that can assist you. We understand the market, know exactly what to look for, have experience negotiating, and so much more. The experience will seem a lot less stressful having someone knowledgeable on your side along the way! Myth 9: Choose A Home Based On Your Current Lifestyle Only. It is important to recognize what you need in a home immediately as well as in the future. Whether you are planning on having children someday or not, buying a home in a neighborhood with good schools should be on your list of must haves. Research has shown that homes in such neighborhoods have higher resale value, so if you ever consider selling in the future you are setting yourself up for success. Also, consider other lifestyle needs that you might develop over time. If you plan on being in your home for the long haul, make sure that what you will want in 10, 20, or 30 years from now is available in the home and neighborhood that you selected. Sell Your Home This May! When should you SELL your Fox River Valley? 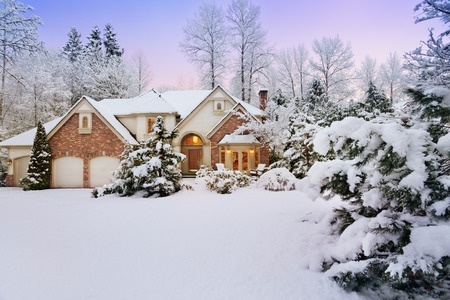 Sellers always want to know what time of year is the best in order to get them top dollar for your home. Although there is some element of unpredictability with the real estate market, time and time again the spring has been the best time for sellers! 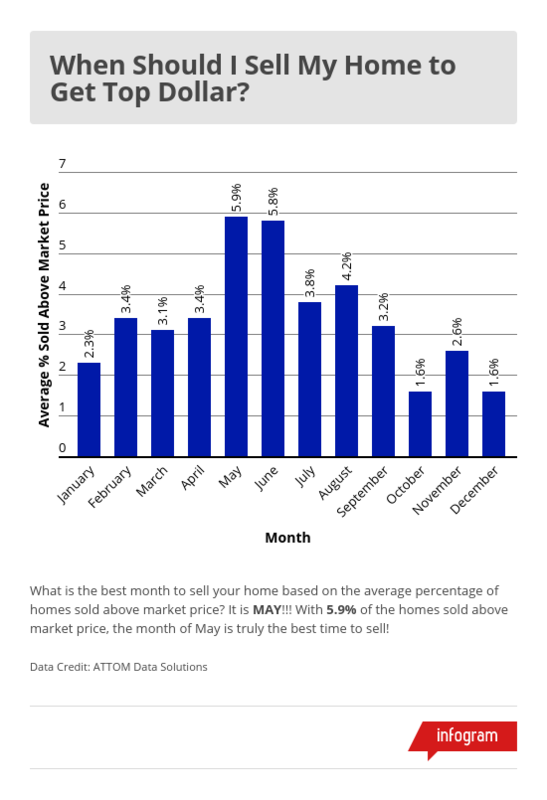 To get an even more accurate timeline for sellers, ATTOM Data Solutions went beyond the seasons to discover what months are the best for home selling. ATTOM analyzed 14.7 million home sales that occurred between 2011 and 2017 to look at the average percent of homes sold above market price each month. When the results came in, MAY was the top performer! May truly is the best time to sell your Fox River Valley home! The Rullo Team Named Top Real Estate Team in Northern Illinois! The 41st Annual Awards Banquet for RE/MAX Northern Illinois was held this past week. This annual awards banquet honored the top realtors in our region for their production in 2017. Out of the 2,300+ sales associates in the Northern Illinois region, Alex Rullo and The Rullo Team, RE/MAX All Pro in St. Charles, was ranked #15!! Congratulations to Alex and The Rullo Team for this remarkable achievement! Along with this recognition for 2017, The Rullo Team have consistently ranked amongst the Top 1% of Realtors Nationwide. Alex Rullo is a charter member of the RE/MAX International Hall of Fame and has won numerous accolades including the Circle of Legends Award, the Chairman’s Award, and the Lifetime Achievement Award! This incredible, award winning team includes Alex Rullo (Broker), Vicky Rullo (Realtor), Sandy Selander (Buyer Specialist), Adam Rullo (Buyer Specialist), Denise Huelskamp (Client Care Manager), and Kristi Capo (Special Project Manager). The Rullo Team is dedicated to providing our clients with the highest level of service. We offer many years of expertise and a wide variety of services to meet all of our clients real estate needs in the beautiful Fox River Valley! Work with the best team around for Buying or Selling your home. Give us a call at (630) 513-1771 or visit our website at www.therulloteam.com so we can begin helping you today! National Ranking Identifies The Rullo Team as One of America's Best Real Estate Teams! Whether you are buying or selling your home, it can be an overwhelming process. It is helpful to work with a dedicated and informed real estate professional who can help you along the way. Although there are many realtors out there, some have proven success in providing the best service for their clients time and time again. We are proud to announce that The Rullo Team was named as one of America’s Best Real Estate Agents! Residential real estate consulting and communications company REAL Trends recently released their 2016 rankings of America’s Best Real Estate Agents. This prestigious ranking evaluates agents by metropolitan area and state. Agents and real estate teams are recognized for their sales volume and/or transaction sides based on data from 2015. To make it into this elite group of realtors, real estate teams need to have a closed sales volume of $30 million and/or 75 transaction sides. 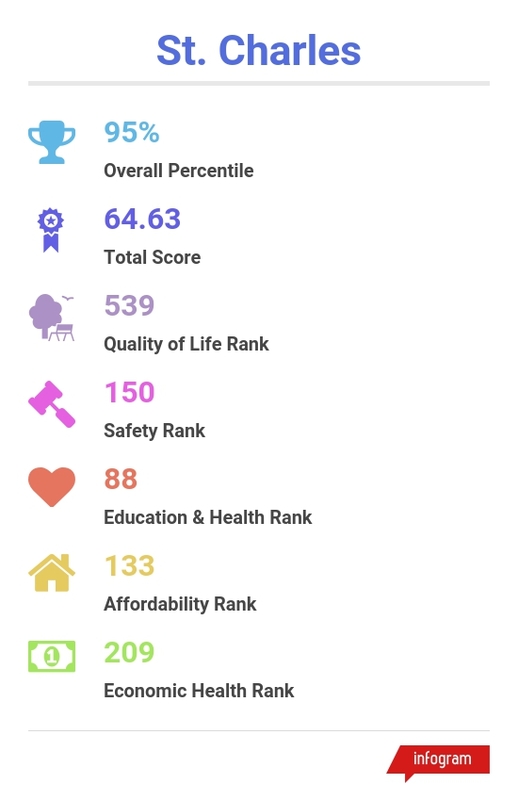 The rankings are beneficial for prospective home buyers and sellers to find the top realtors to work with in their area by an unbiased resource. The Rullo Team is proud to join the other agents within the RE/MAX national network who were recognized in REAL Trends’ ranking. We are part of the 2,691 RE/MAX agents and real estate teams included in the rankings, accounting for nearly one third of all realtors included! Alex Rullo Named As One of the Top Real Estate Agents in Illinois! 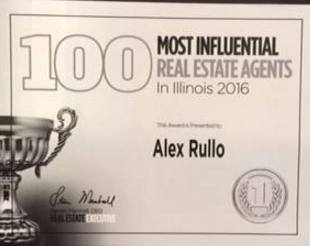 CONGRATULATIONS to Alex Rullo and for being named one of the 100 MOST INFLUENTIAL REAL ESTATE AGENTS IN ILLINOIS!! Here at the The Rullo Team we are incredibly proud of his achievement. We strive to provide the top service to our clients whether they are interested in Buying or Selling real estate in the Fox River Valley. Alex Rullo received this award from Real Estate Executive Magazine. Every year the magazine does comprehensive research to find the 100 most influential real estate agents in each state. Alex Rullo was selected based on his hard work, dedication, and service as a realtor in Illinois. We provide all of our clients with The Rullo Team Advantage. We are here to assist you with all of your real estate needs. Let us help you find your dream home today! Check out our Current Homes for Sale to begin your home search. Alex Rullo and the rest of the team will help you with the entire process! Call us or visit our website at http://www.therulloteam.com/ to work with our award winning team! The housing market recovery in the Chicago area continues at an uneven pace.